Xiaomi's 2018 Mi 8 flagship smartphone is far from outdated., and it still has a lot to offer at a very low price. Time to find out how well it compares to current premium smartphones. Recently waves have been made in the UK marketplace by the company known as Xiaomi with launch events and shop-opening sessions.. Founded in April 2010 and listed on the Main Board of the Hong Kong Stock Exchange in July 2018, Xiaomi has built up a reputation of being friends with its users as it developed a range of smartphones and other smart devices connected via an IoT platform. Included in the company’s range of smartphones is the enhanced Mi family of devices. It's interesting that the Mi 8 is now basically priced similarly to the Pocophone F1, also a very good device from Xiaomi. You get a more premium feeling build with the Mi 8, but a smaller battery. You have NFC on board, and a slightly bigger display that's AMOLED and not LCD. You get a secondary zoom lens on the back and not just a depth sensor. But, the speakers are worse than the Pocophone's. So is it a tough choice between these two? While it might feel like that, we hope this review has helped you reach a conclusion of your own. By any standard, the Mi 8 is one of the best smartphones available in its price range. But when Xiaomi introduced the Pocophone F1 in August, I thought that it has generally the same specs as the Mi 8 for a lower price. We're sad to see Xiaomi not keeping up with its rivals in terms of wireless charging, waterproofing and a Quad-HD screen, and that the highly anticipated in-display fingerprint is unique to the Explorer Edition, but at this price we can hardly complain. Amazing phone, highly recommended. 86% Xiaomi Mi 8 High-End-Preiskracher aus China? Positive: Nice display; fast system. Negative: No headphone jack. Model: The Xiaomi Mi 8 is a flagship smartphone released by the company. The naming of the Xiaomi Mi 8 (skipping the Mi 7) is in celebration of Xiaomi Inc's eighth anniversary. The Mi 8 measures 154.9 x 74.8 x 7.6 mm and weighs at 175 g. It has an ultra-thin four-sided curved body. It is lightweight and curved on all four sides, which features amazing hand-feel and is comfortable to carry. The Mi 8’s curved-edge glass body is in a 7000 series aluminium alloy frame, which feels premium. As for color options, it comes in blue or black finish. 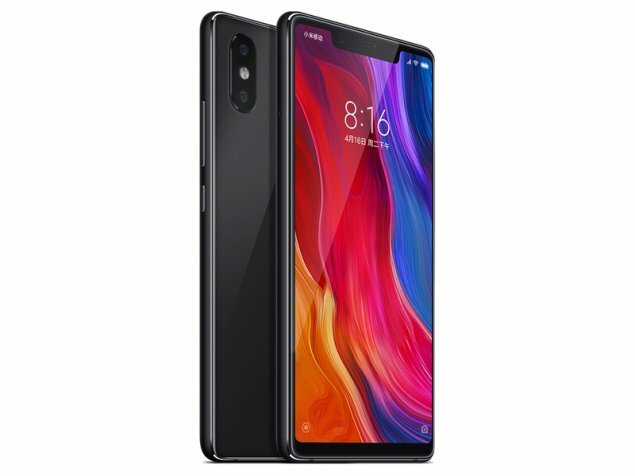 As for the screen, the Xiaomi Mi 8 features a 6.21-inch AMOLED Full-Screen Display with a resolution of 2,248 x 1,080 pixels. Note that a phone of this size would traditionally have a 5.5-inch display. As a result of full optimization of the space available on the smartphone, it has an 18.7:9 screen ratio and 86.68 % screen to body ratio for the bigger screen. It has a wide notch on the top of the screen. For the rear camera, it has an AI dual camera with optical zoom. The 1.4 μm large pixels brighten and bring out the details of nightscape photos while SLR-quality dual-pixel autofocus allows the Mi 8 to snap photos rapidly. With seven Studio Lighting Modes, the Mi 8 is a portrait studio in the pocket. Users can instantly transport portrait to the shadow under a summer tree, or beneath a window where gentle rays shine through. The AI camera can distinguish between 206 common scenes and automatically adjusts exposure, saturation and other optimizations. Besides that, with seven AI-powered effects, users can edit, add music and mix colors to give video the feeling of Hollywood trailer. As for the front camera, it features a 20 MP front camera, which has 3D Beautify to blur backgrounds for stunning portraits. It has powerful analytic capabilities coupled with 1.8 μm large pixel (4-in-1 Super Pixel) technology to produce clearer, brighter selfies. The newly upgraded 3D Beautify uses AI to blur backgrounds with a single camera. It's as if each shot is taken in front of a studio canvas. The processor of the smartphone is a Qualcomm Snapdragon 845, which has a clock speed of up to 2.8 GHz. It also comes with a Qualcomm Adreno 630 GPU with up to 710 MHz. It is paired with 6 GB LPDDR4x dual-channel and 64 GB or 128 GB UFS flash storage. Powering the Mi 8 is a 3400 mAh battery, which supports Quick Charge 4+. The battery is charged by plugging the included 18 W QC3.0 charger into the reversible USB Type-C port. As a conclusion, the Xiaomi Mi 8 is a rival to any top-spec flagship phone out there. Despite featuring great design and performance, it is more affordable than many other flagship phones. There is a little compromise here and there, with the battery can be more long-lasting, software being not as clean as stock, and the camera is not the greatest of its class, but it is still a great choice for the price. 86.18%: This is a good rating above average. Nevertheless you should not forget, that 10-15% of all notebook-models get a better rating.